All three books in the #1 New York Times bestselling Divergent trilogy are available together for the first time. 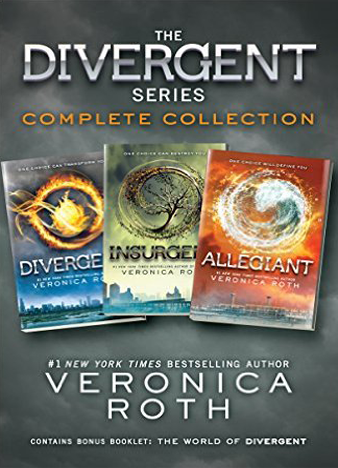 Perfect for gift givers, collectors, and fans new to the series, the collection includes Divergent, Insurgent, and Allegiant, as well as bonus content: a 48-page guide to the series, including Faction Manifestos, a Faction Quiz and Results, a Q&A with Veronica Roth, playlists, discussion questions, series inspirations, and much more! Insurgent: One choice can destroy you. Veronica Roth’s second #1 New York Times bestseller continues the dystopian thrill ride. As war surges in the factions all around her, Tris attempts to save those she loves—and herself—while grappling with haunting questions of grief and forgiveness, identity and loyalty, politics and love. Allegiant: The explosive conclusion to Veronica Roth’s #1 New York Times bestselling Divergent trilogy reveals the secrets of the dystopian world that has captivated millions of readers.